Canine Cottage is a country resort for your dog's vacation. The yard is huge with plenty of room to run and play. Your dog will enjoy a private area while inside. Dog's love coming to Canine Cottage. Does your dog need to be walked? We can set you up with a monthly contract or on an as needed basis. Dogs love to get outside and walk. Sometimes you need to go away and your pet would prefer to stay at home. We can come to your home multiple times a day to feed your pet and take them for a walk if needed. Cats love to stay at home. There comes a time in every pet owners life that they will need some help with their beloved pets. We are here for everyday life and emergencies that may pop-up. Going on vacation? You may need to board your dog. Rehabbing from a surgery? We will walk your dog for you. In an assisted living facility? 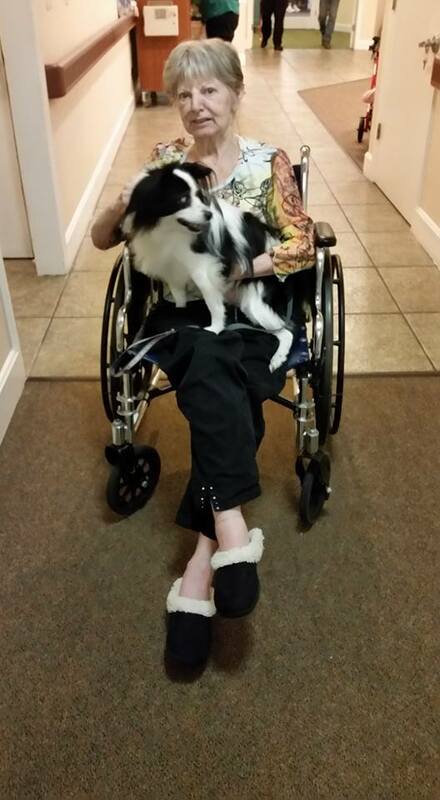 We visit the assisted living facilities multiple times a day to walk and care for the pets. Sometimes the pets temporarily live with us and we bring them to you throughout the week for a visit. All About Paws will try to find a solution for any problem with your pets. Please contact us with any issues you may have, we may have the perfect solution for you!